Peggy Sue’s Restaurant in San Jose is a 50’s diner-style restaurant in downtown San Jose. I had a break from watching my daughter’s volleyball tournament at the nearby convention center. So I walked over in the rain and entered a packed restaurant. A line of volleyball players, fifteen-deep waited at the order counter. 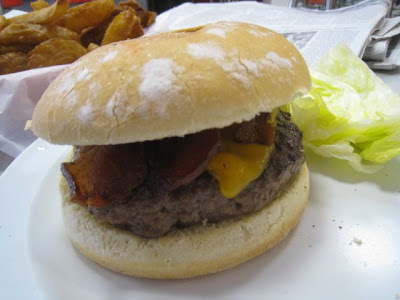 Ten minutes later I placed my order for a Lucy Burger ($7.45), I upped it from 1/3-pound to 1/2-pound. 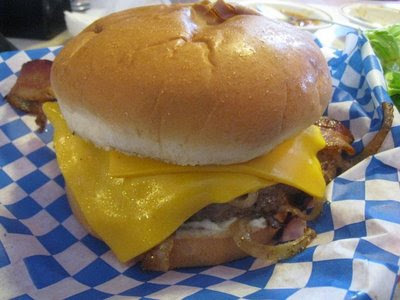 The Lucy comes with bacon and American cheese. I also ordered fries ($1.85), onion rings ($2.15) and chocolate, peanut butter shake ($5.00). I took my seat at one of the few unoccupied laminate tables sitting on the clean black and white tile floor. Posters, photos and articles from the 50’s adorned the walls. My number was called and I retrieved my food. The shake was thick and creamy, and nicely presented with whip cream topped with sprinkles and a cherry. There was way too much peanut butter, in the mix, overwhelming the chocolate. The burger looked good. The bun looked right out of the bakery, but it was not toasted. Although the patty was cooked medium, the meat was not juicy. 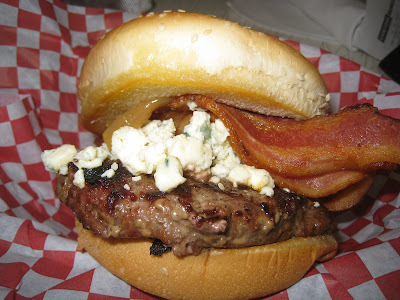 The bacon was not that crisp and the burger wasn’t that hot. Overall, it was pretty average. The fries were medium cut but, equally unremarkable. 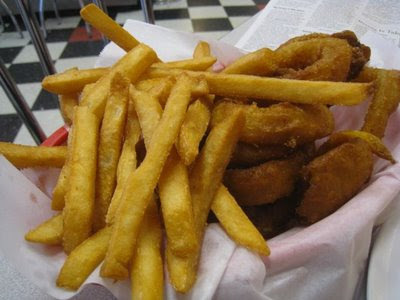 The onion rings were medium thick and battered, but not crisp. 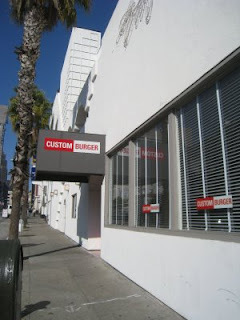 As I walked out I noticed a sign on the front that said “Best Burger Silicon Valley 2004, Wave Magazine Readers Choice.” Either that means Silicon Valley readers didn’t try many burgers or Peggy Sue’s has lost some quality since 2004. 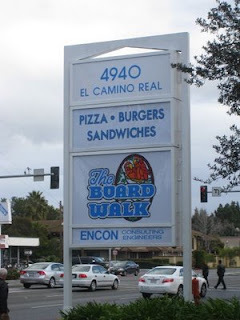 The Boardwalk in Los Altos, CA is a cozy hang out for having a classic style burger. They also have pizza and a bar and lots of comfort food like chicken wings, tuna melts and pastrami. But I came into the wood-lined hangout with a burger on my mind. There was a line at the counter at noontime on a rainy Wednesday. The flat screen TV's had soccer going. I think it was a World Cup qualifying match. 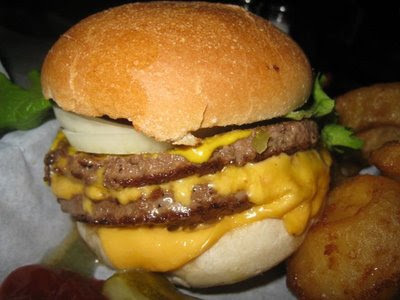 I ordered a double cheeseburger ($6.80) consisting of two 1/4-pound patties, American cheese, mayo, mustard, lettuce, tomato and onion slice. 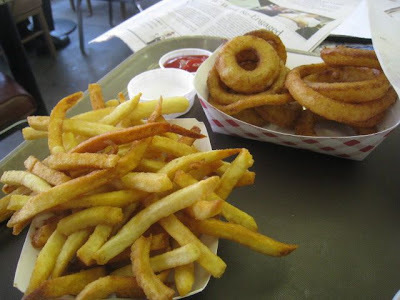 I also ordered onion rings ($2.45) and fries ($2.25). The nice girl at the counter offered to split the order so I didn't have to pay for both. They gave me coaster-pager and I walked across the wood floor, to take a seat at a wood table on a wood chair next to a wooden bar. It was about 5 minutes later that the pager went off. I strolled to the counter to get my food. I asked for ranch dressing for the onion rings and was granted my request. The burger looked fantastic. 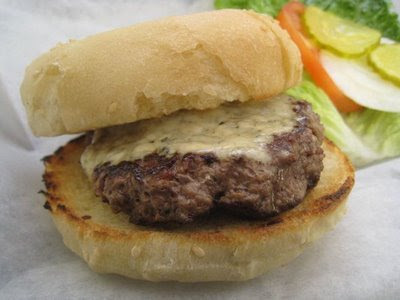 A very nicely formed white bun cradled two impressive patties dripping with melted cheese. 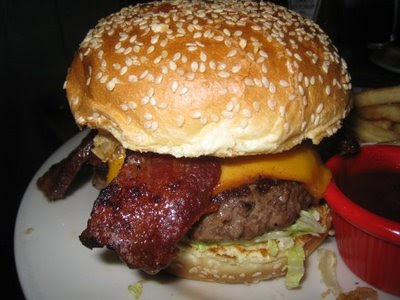 As I bit in, the bun was pleasantly crunchy on top but springy and spongy on the inside to soak up the juice. The combo was a very tasty and balanced blend of all the flavors. It reminded me a lot of the Oasis in Menlo Park. I learned the restaurants are related, because I got a gift card for Christmas that has them both on it. Checking the website, the Oasis is listed as another location along with the Garrett in Campbell and Jakes in Willow Glen, Sunnyvale and Saratoga. 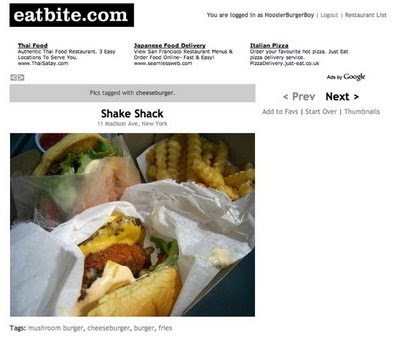 The menu looked the same on the other sites. The onion rings were battered and while hot, I found them, to be not too crisp on the outside and a little chewy on the inside. The fries were better, although standard-issue medium-cut with skins on. They were hot and relatively tasty and didn't have the "old grease" taste I seem to find at a lot of places. But the burger is definitely worth the visit. It also looks like a fun place to take in a game or the upcoming March Madness. 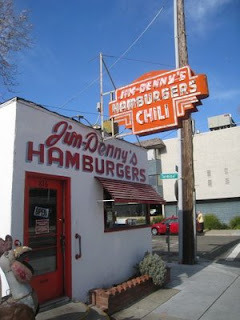 Jim Denny’s in Sacramento is a Jim Dandy of a place for a burger. 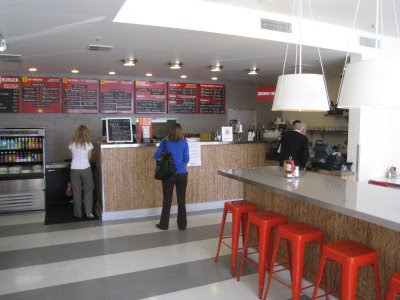 A Sacramento fixture for years, it was resurrected a few years ago and now serves up a great hamburger. You can’t miss the landmark as you walk up 12th street from the Convention center. 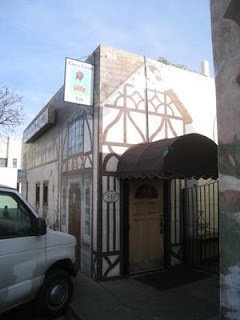 It is a small white building with a vintage red sign out front. On a Saturday afternoon, the tables outside were packed with people eating and waiting for their to-go orders served up at the side window. 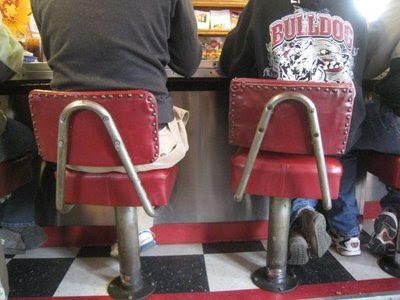 The real action is inside, where a small counter of about 10 chairs faces the griddle. Patsy, the owner fries up burgers starting with the tiny 1/6-pound model going all the way up to a 1-pound monster. I went for the 1/2-pound Superburger with fries ($8.75). 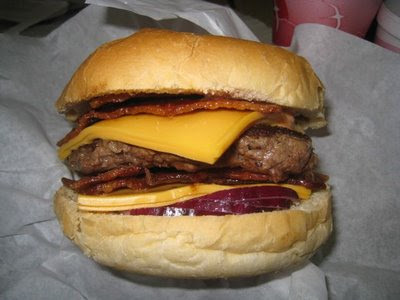 I added American cheese ($1), Bacon ($1) and grilled onions. Patsy slapped the fresh beef on the griddle and chatted with us as we waited. I also ordered up a blackberry-Oreo shake on her recommendation. The shake came first. I found it creamy and perfect. The Oreo and blackberry nicely played off against one another. Yum. 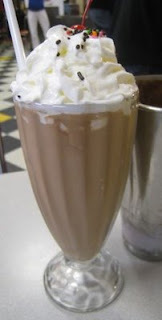 My friend Margaret ordered a chocolate shake along with her Superburger. She liked it as well. When the burger was ready, one of the servers asked us what we wanted on it. Mustard, yes. Mayo, yes. Lettuce, no. Tomato, no. I really liked the interaction. At one point a friend called to join us. I ordered a burger and fries for him and they let us save a place at the counter. When he arrived the burger came right off the grill for him. Great service. My burger was yummy. The classic white bun was toasted nicely. The American cheese hung out on the side artfully. It was just the right amount of mayo and mustard. The beef was tasty and juicy. The fries were thin, crisp and salty. I really do not know how you can improve on an experience like this. (Except if they had onion rings.) It was a fun walk back to a time when things were simpler and everyone was friendly. I cannot recommend Jim Denny’s any more highly.